Discard 1 card; Fusion Summon 1 Fusion Monster from your Extra Deck, using monsters from either side of the field as Fusion Materials. Cards and effects cannot be activated in response to this card's activation. This is an advanced form of Polymerization, and an inferior to Ultra Polymerization. Polymerization allows Materials from the hand. This card alllows an opponent's monster to be used. Ultra Polymerization Fusion Summon without losing Fusion Materials. In the anime, Synchro Material has a similar effect to this card, except it supports Synchro Monsters. This card has an anime-only support card, known as Wicked Canon. This card has an Xyz counterpart: Destiny Overlay. In Yu-Gi-Oh! ARC-V, this card generates a special Fusion Summoning background. If "Evilswarm Ophion" is applying its effect that prevents Level 5 or higher monsters from being Special Summoned and you only have "Elemental HERO Escuridao" in your Extra Deck, you cannot activate "Super Polymerization". Also, when you control "Petit Dragon" and the opponent controls "Firegrass", "Evilswarm Ophion" and 3 Dragon-Type monsters, if you activate "Super Polymerization", the only monster you can Special Summon is "Darkfire Dragon" using "Petit Dragon" and "Firegrass" as Fusion Materials, and since "Five-Headed Dragon" is higher than Level 5, it cannot be Special Summoned. : If you only have "Elemental HERO Escuridao" in your Extra Deck and the opponent controls "Evilswarm Ophion", can you activate "Super Polymerization" using the opponent's "Evilswarm Ophion" to Special Summon the level 8 "Elemental HERO Escuridao"? Also, when you control "Petit Dragon" and the opponent controls "Firegrass", "Evilswarm Ophion" and 3 Dragon-Type monsters, if you activate "Super Polymerization", can you only Fusion Summon "Darkfire Dragon" using "Petit Dragon" and "Firegrass" as Fusion Materials? Or can you use the 5 Dragon-Type monsters including "Evilswarm Ophion" to Fusion Summon "Five-Headed Dragon"? The prevention of "Super Polymerization" means that no card or effect can be chained to its activation. Therefore, when "Super Polymerization" resolves and the Fusion Monster is Special Summoned, "Torrential Tribute" or "Bottomless Trap Hole" can be activated. 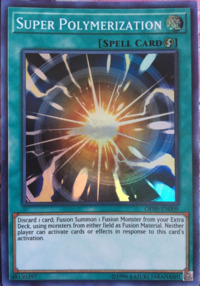 : Regarding "Super Polymerization" prevention of effects being activated in response to its activation, can "Torrential Tribute" or "Bottomless Trap Hole" be activated when the Fusion Monster is Special Summoned by the effect of "Super Polymerization"? "Super Polymerization" prevents effects from being chained, but Continuous Effects are still applied. Chain Material: You can use "Chain Material's" effect when resolving "Super Polymerization", but you can only remove from play cards that you control.